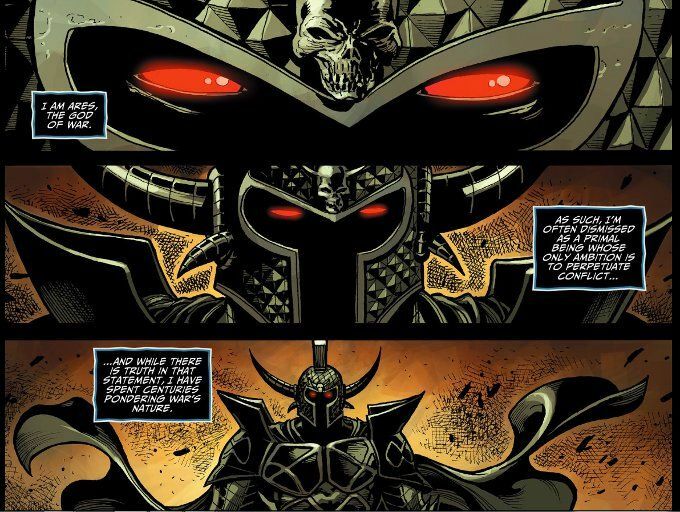 The latest chapter of Injustice is primarily focused upon Ares, as he ponders his past, the natures of conflict and humanity and how he came to be The God of War. This flashback serves as a prelude to the most recent events in the battle between Superman and The Ancient Greek Gods, as Ares plots with Superman and Lex Luthor as Wonder Woman confronts Batman. For an issue focused on the God of War, this issue is surprisingly light on action. Yet Brian Buccellato's script does a fine job of exploring Ares motivations. And the final scene between Wonder Woman and Batman suggests plenty of action in the next issue to make-up for the lighter pace of this week's comic. Tom Derenick was the perfect artistic choice for this particular chapter. Derenick's style lends itself well toward the epic scale and one doesn't get much more epic than dealing with the ancient gods! His inks are a bit heavy at times but these moments are few and thankfully far between. The color art by Rex Lokus and lettering of Wes Abbott prove equally skillful.